A perfect expression of Sicilian entrepreneurial dynamism, but also of its fine taste, Fegotto remains an important testimony to the island’s historical and cultural heritage, especially of this area, in which it played a central economic, political and social role until the mid-20th century. The evocative atmosphere of the architectural complex of the villa makes Fegotto a must-visit place along the cultural routes of south-eastern Sicily. Unsurprisingly, perhaps, both the manor house and the historic gardens have retained their original layout and décor. On the one hand this has earned Fegotto the attention of a vast audience of scholars and enthusiasts, while on the other hand it has captivated various major Italian film directors and set designers, who have chosen Fegotto as the stage for great works, such as Marianna Ucrìa and Inspector Montalbano. 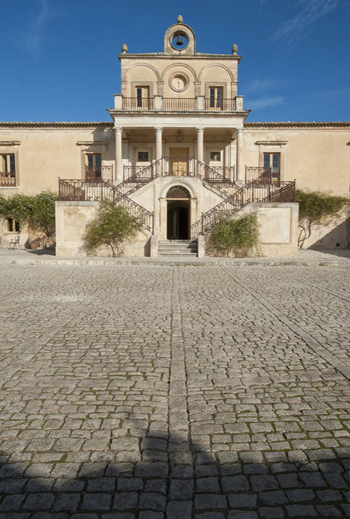 The villa, its 19th-century agricultural buildings such as the palmento where grapes and olives used to be pressed, and the barn, as well as the chapel, courtyards and gardens, are the perfect place not only for a memorable visitor experience, but especially for public and private events and functions.